Lightweight and easy, this sheer bra top or bra cover features ruffle trim, beaded tie in front, and dangling coins; it's a lovely way to complete your belly dance look. 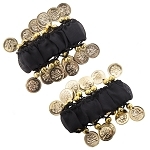 Lightweight and easy, this sheer black bra top features ruffle trim, beaded tie in front, and dangling gold coins; it's a lovely way to complete your belly dance look. Pair with chiffon hip scarves bracelets, and more for a total belly dance ensemble. Comes in one adjustable size that ties in back and has adjustable straps; foam pad inserts sewn in. Can be worn alone or over a regular bra for more support. Chest- 35 inches; Ribcage- 27 - 35 inches; Ties- 13 inches each; Shoulder Straps- Adjustable from 8.5 -16.75 inches each.